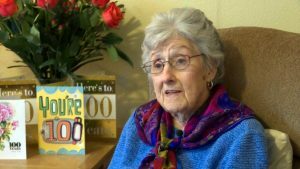 OATFIELD, Ore. (KGW) – Not only was it Election Day on Tuesday, but it was also a big day for a woman in Oatfield, Oregon. On Tuesday, Vida Francis Stevenson turned 100 years old. She was born in Woodburn, Oregon, in 1918. She was feeling great on her milestone birthday. “I feel pretty good for an old lady,” she said. Add to the excitement of turning 100, her birthday is also Election Day. “I made sure my girls signed up to vote,” said Vida. Vida said she’s always been keen on her civic duties, always taking advantage of an opportunity to vote. In fact, she said she remembers when she wanted President Hoover out of office. He was president from 1929 to 1933.